The APC started off their national specialty show's week of events with an AKC Hunt Test on the grounds of the York Pointer Setter Club in Pennsylvania. 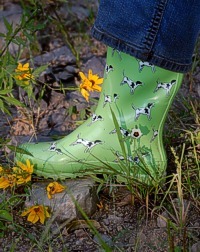 For once, the grounds in Pennsylvania didn't require mud boots. But one attendee couldn't resist these gems, anyway. Nancy, getting ready to seed the back course with quail from horseback, talks bird planting with Laurie, the event co-chair. Wayne (gunner) and Mary (bird planter) discuss the conditions as they wait for the first Master brace to head out. 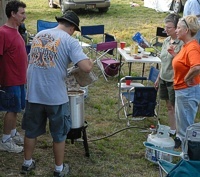 All of that blaze orange is essential near the bird field - real shotguns will be throwing real shot, and everyone needs to be seen. Waiting on the line between braces is a chance for both dogs and their handlers to get to know one another. A typical breakaway from the line: two dogs, two handlers on foot, two judges on horseback, and a mounted marshall bringing up the rear. The on-deck dogs waiting in the gallery can rarely take their eyes off of the preceding brace as it heads into the back course. With a Master brace away on the back course, the two gunners head into the bird field, where they'll wait for the handlers and judges to appear and work birds. 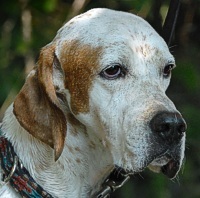 It can be a challenge to keep a well-muscled, fired-up bird dog comfortably at the end of a lead when watching other dogs work, and while down-wind from a field full of Chukar. 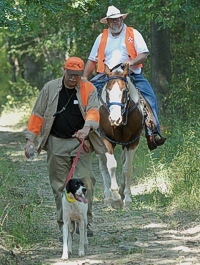 This Pointer's handler has him in a simple loin hitch. 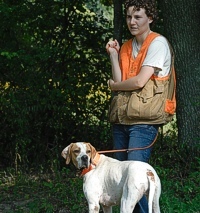 A relaxed handler keeps to the "don't over handle" mantra, and lets her Pointer work the field. A Senior brace's handlers have followed their dogs to opposite corners of the bird field. The gunners have split up to follow them. No wonder she's relaxed - she's got more than one dog running in the event. 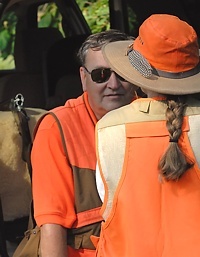 Judges Mike McCleary and Cindy Stahle talk bird field logistics with the gunning team. 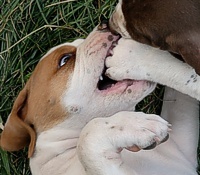 With an odd number of dogs in both the Senior and Master tests, the last braces required a "bye dog" - a finished Master dog to serve as a bracemate. Yes, that's a German Wirehair kindly standing ready to help out his Pointer cousin for the test. Gunners can't talk much with the handlers while the test is under way, but the walk back out of the field is a good chance to review how things played out. The bye-dog's handler (and his fine Wirehair) get their reward, and a just-shot Chukar is retrieved to hand. Good boy! Safely back at the gallery, the bye-dog handler's cheering section welcomes him back from the field. 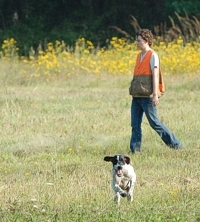 A Pointer and his handler make their way in front of the Junior test judge. And right on cue, we get birdy at the edge of some cover just yards from the judge. More waiting on the breakaway line and gazing after the current brace. Soon, buddy. A peaceful moment between Pointer and handler before meeting up with the judges. 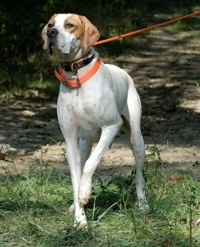 The handler's eyeing the bracemate, and the Pointer's eyeing the field. A nice point on the Junior course. As the handler approaches, he's reaching for his blank gun - that bird could pop up at any time. It IS the Junior course, so it's not unusual to see a pointing dog's bracemate come wandering in to see what's going on. Another brace heads up the path to the Junior A course breakaway. Elsewhere on the grounds, the B course was running dogs, too. Just like with their handlers, every dog's face has got a story. The course marshal follows a handler up to the line. Two young Pointers break away from the line. Stretching it out in the bird field. A flushed quail sprinted across the field and went down in this thick cover. This Junior dog is on the case. A very hot day. Stella, Tattoo, Piper, and Uma stay cool. The metallic mesh tarp blocks most of the sun and still allows some air to move. On a 95-degree day, a stake-out in the shady weeds is just about as much as you can ask for. That's a lot of pointers. And quite the ex-pen. The sun's going down, and the pups are starting to wake up a bit as the temps drop. Little angels, every one of them. Yessiree. Eh, that's all too much trouble. 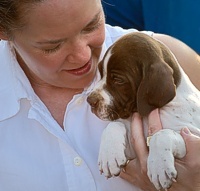 Pointer puppy, doing its job. Even at a specialty event, there's a chance to meet other dogs. Judge Pat Sanborn brought along some of her Gordon Setters. And, one of her Gordon pups, Jasmine. And, a romp through the Junior bird field just before sunset to look for leftover quail found her in great form. Following which, a much-needed cool-down in the club house's horse trough. Finally, some reliefe from the day's heat. This is Handler-Henge. 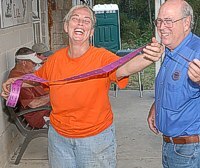 Laurie finds a mark â€¦ er, customer â€¦ for a raffle ticket spread. Food first, and that pile of club-supporting raffle stuff for dessert.